If you're not sick of hearing about the teen labor force participation rate I've got yet more today. 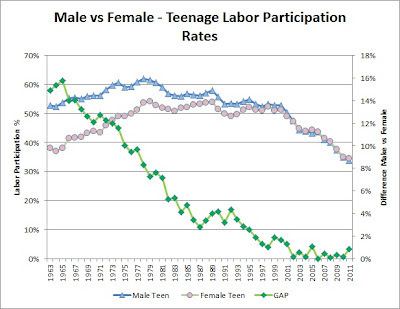 I figured it would be relevant to look at the participation rate for teenagers (age 16-19 years) between males and females. As a whole teenagers participation rate went up in the 60's and 70's then have been declining since the 80's. In the entire labor force men have been working less and women have been working more. The labor participation rate of women went up significantly from the 60's to now. They went up from under 40% to almost 60%. Women worked more and more from the 60's to the 90's or so when it flattened off and lately in the past decade its started to drop. But at the same time the % of men who work has declined gradually for the past 50 years and has dropped from 80%'s to 70%'s. But the overall labor force was on an upward trend then flattened off and is reflecting the trend for women. Do teenagers follow that same pattern? I got the data from the BLS A1 tables again. I had to do some math to get the numbers for male and female teenagers. I simply subtracted the over 20 year old numbers from the over 16 year old numbers to get the 16-19 year numbers. 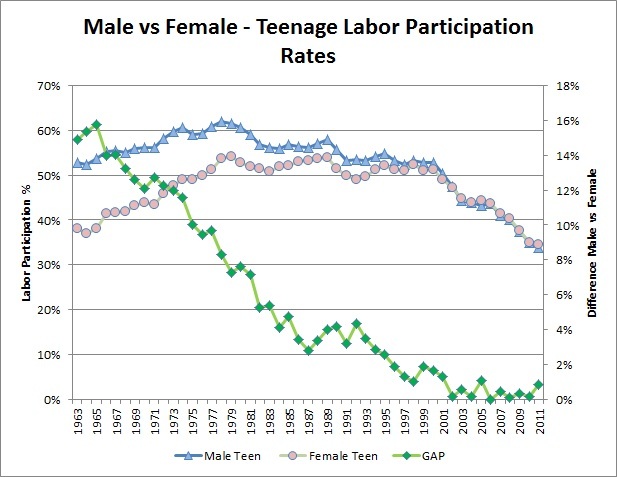 As you can see both male and female teenagers had the general pattern of labor force participation. Both sexes had increased rates in the 60's and 70's and then have had decreasing rates from the 80's onward. In the chart I plotted the green line to show the gap between the sexes. For most of that time men worked more than women. However today the women work a little more. Today the rate is almost the same and differs by less than 1%.